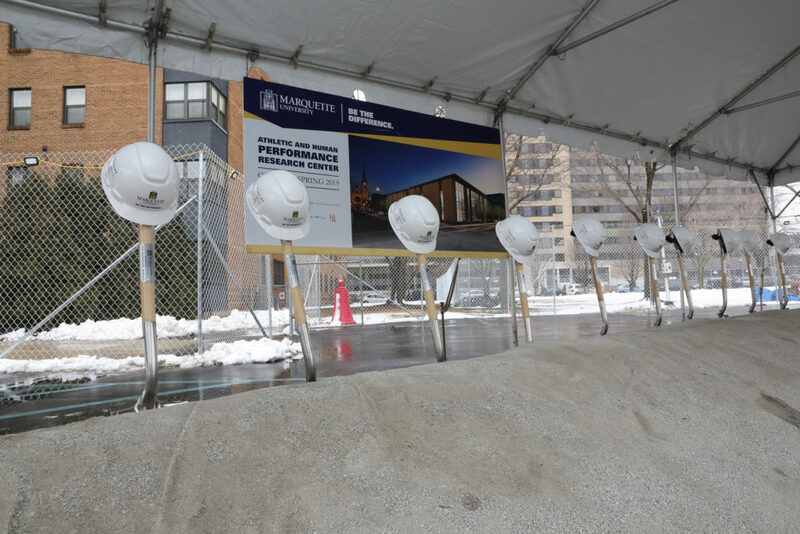 With snow flurries as the backdrop, Marquette University on Tuesday, March 6, broke ground for its new 46,000-square-foot Athletic and Human Performance Research Center. More than 200 members of the Marquette community, university trustees and research partners attended the ceremonial dig at the project site near the southwest corner of North 12th Street and West Wells Street. Board Chairman Owen Sullivan emceed the event, which featured remarks by President Michael R. Lovell; Dr. Jeanne Hossenlopp, vice president for research and innovation; Bill Scholl, vice president and director of athletics; and Grace Gabriel, women’s lacrosse player. Rev. Nicky Santos, S.J., provided a blessing. Additional strength and conditioning spaces for the athletic department and a centralized core of laboratories for conducting human performance research. Initial construction is expected to begin next week. Follow Marquette Today for updates on the AHPRC as they develop.